It is known as the world’s highest, longest glass bridge connecting Lishuya and Wuwang slopes, being 430meters long and 300 meters high above the valley floor. The thrilling bridge is an architecture wonder designed by Haim Dotan and made up of transparent glass with a bungee jump platform at the bridge center, where you can try the highest bungee jumping in the world, while at the same time having a panoramic view of the majestic Zhangjiajie Grand Canyon. 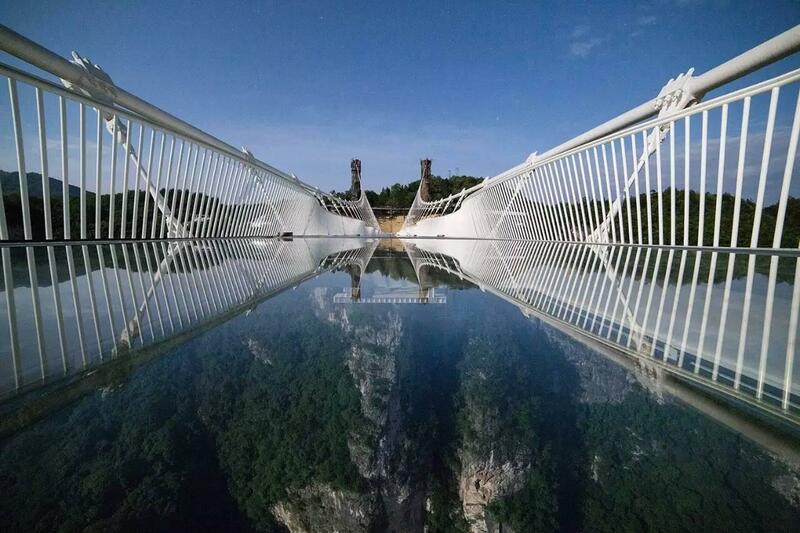 Zhangjiajie Glass Bridge was built with 99 sheets of glass, is 470 yards (430 meters) long, 6.6 yards (6 meters) wide and 985 feet (300 meters) high. The Glass Bridge was opened to the public on August 20, 2016. 1) You can take the shuttle bus from Wulingyuan Bus Station to Cili county and get off at Grand Canyon, taking about 20 minutes and fare is RMB 12. 2) You can take the long-distance bus from Guanghe Mall in Zhangjiajie to Jiangya Hot Spring(江垭温泉) and get off at the Canyon. The bus departs every 60 minutes with a duration of 1 hour and a ticket price of RMB 20. 3) You can also take the direct bus from Zhangjiajie Center Bus Station to the Canyon with a duration of 1.5 hours.